THE IDIOTS' BOARD: SWAMPS & NO CLASSES. Good job PAG-ASA. Good job CHED. 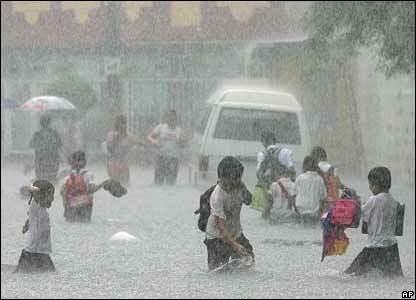 Swamping caused by heavy rains within Metro Manila ends on declaring class suspension. Students enjoy the idea of classes being suspended. Such idea gives them a second option of malling, playing computer games, watching movies and etceteras of a student's day out besides studying (hhmmm do they?). Another savings from their allowances for certain extra-curricular activities outside of school (you know what does this mean). A two thumbs-up for every students. Declaration of class suspension is done when students are already in school. Not to mention, it's always the case. That's how our government works. More or less, around 50% of the students are being alarmed by such declaration (Not an exact statistics). Sad to say unlucky are those poor students. Papasok, susulong sa baha at pagdating sa school, suspended ang classes. Uuwi susulong ulit sa baha. Sakit ang nakukuha. What does SONA say about this? - Sugpuin ang kasakiman ng nakaraang administrasyon! The bad side of being idealistic is too much engrossed with perfection, leaving small things behind.